As I discussed in my first ever blog post, The Beauty of a Postcard, sending postcards is a slightly archaic means of communication, in comparison to the plethora of alternative digital options available to us nowadays: texts, emails, Skype, Facebook, Twitter. The ability to use our phones, laptops and iPads abroad either through roaming or Wi-fi (now found in all four corners of the planet) means fewer and fewer postcards are being sent. Despite this, I still love rummaging through postcard stalls and finding one lying among the post on the doormat. I (along with many others) find it infinitely more personal than a Facebook album shared with 1,000 other people. So while most people prefer to communicate digitally nowadays, it takes away the pleasure of receiving a postcard from some far-flung destination. Well now someone has come up with the digital answer to this conundrum. 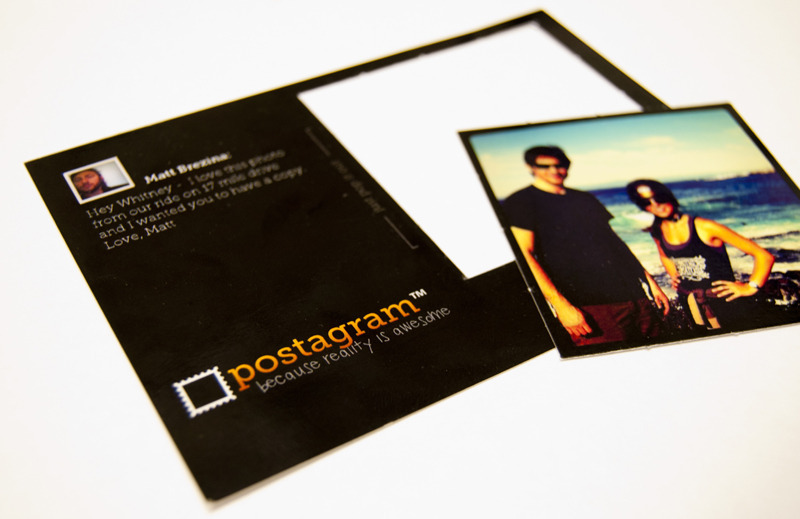 Postagram is a new app that can be downloaded onto your iPhone or Android device. It allows you to choose any photo from Facebook, Instagram or simply a photo taken on your phone and have that sent printed in postcard format, along with a 140-character greetings message. It will then send that postcard to any address within 2-5 days. Not only this, the recipient of the Postagram postcard can then pop out the photo (if they choose to) as shown in the photo above. Apparently this has been around in the US for around a year (costing just 99 cents) but it’s just being unveiled in Europe. I’m not exactly sure how much it will cost over here but it’s likely to be similarly affordable. This means that you’ll be able to send home to your family and friends a postcard with of you in a Venetian gondola/under the leaning tower of Pisa/walking along the Great Wall of China, instead of just a generic photo of these various locations. And as the Postagram postcards are printed and dispatched from London, it means there’s no risk that foreign postal services will lose your postcard. I think this is a brilliant idea! I reckon it will add a whole new aspect to sending postcards from abroad, and I’m looking forward to trying it out on my next trip.